For the past month I have been using SOLIDWORKS on a YogaP40 Touch Screen computer. The main purpose of getting this laptop was for the WACOM tablet technology in the touch screen to allow me to draw and sketch on the screen in the new SOLIDWORKS INDUSTRIAL DESIGNER tool. That experience has been fantastic and super fun to use. However, as often as I can, I am also trying to use the “classic” or desktop version of SOLIDWORKS with the touch screen. 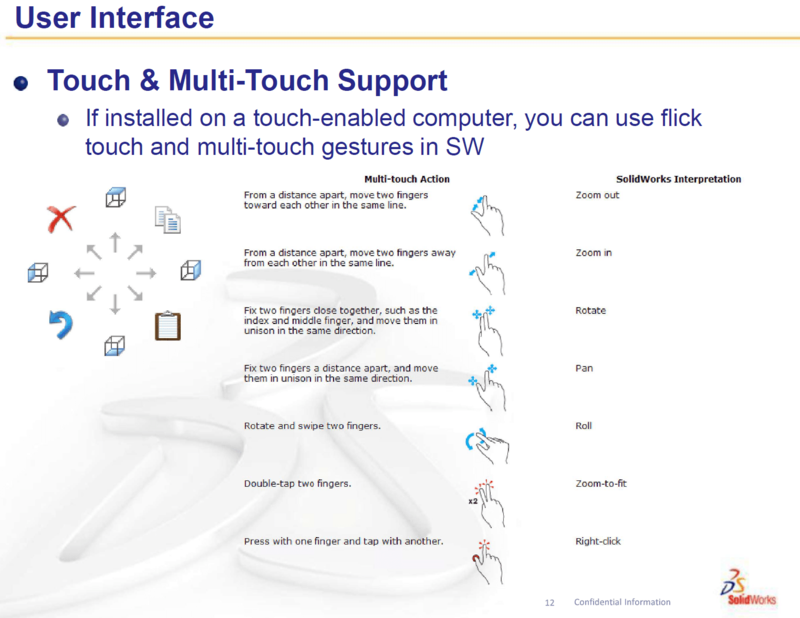 Did you know that SOLIDWORKS introduced touch controls in the software in 2010!?! At this point the touch controls are only giving you the ability to zoom/pan/rotate (pinch, two finger drag, etc), but after a very short amount of time with it it does become very easy to use. This along with the mouse gestures (or in this case “pen” gestures), which I didn’t ever find myself using much before with a mouse, make it possible to do just about everything you need to do. I have been using a combination of my finger and the pen/stylus that comes with the YogaP40, to select and draw. I agree at this point I am still not as fast as I am with a mouse, but it SURE is “different” feeling which in this case for me translates to MORE FUN! The only thing I am REALLY missing when I fold the laptop screen over and go into tablet mode for SOLIDWORKS is the CTRL and ESC keys! The pen/stylus does have two programmable buttons and I have set one of them to the ESC key because you absolutely have to have that one. But I really need the other button programmed for Industrial Designer to be the “erase” button, so I cannot program it to be the CTRL key. It’s a “Didn’t realize it so much till it was gone” kind of situation, but are quite a few things I have run into where you just gotta have that CTRL key in SOLIDWORKS. There is of course a pop up keyboard if you need it when you are in “tablet” mode, but trying to use that just for the use of the CTRL key ends up being more of a struggle because it takes up so much room at the bottom of the screen and hides what you need to select most of the time. The YogaP40 has a good inch of “dead space” on the top and bottom of the bezel of the screen and about a half an inch on the sides… It would be AMAZING if the YogaP40 had 2 to 4 hard buttons somewhere on there that could be custom programmed just like extra buttons on a mouse. Anyone else tried running SOLIDWORKS with a touch screen? Would love to hear what you have tried/learned. Like I said, it really is NOT that hard to do and very fun all over again! I have been using my FINGERS for zoom/pan/rotate, and the pen for selections and drawing.